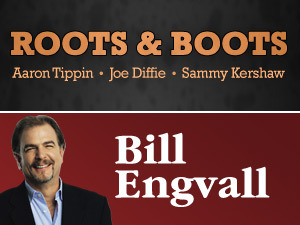 Home > News > News > Roots & Boots and Bill Engvall! Roots & Boots and Bill Engvall! We’re so excited for the next two shows coming to the AMT stage – Roots & Boots at 8 pm on Friday, January 27 and Bill Engvall at 3 and 7 pm on Sunday, January 29. Looking for a chance to see three incredible country music stars in one great country concert? Here’s your chance! Sammy Kershaw, Joe Diffie and Aaron Tippin join forces in the Roots & Boots tour to swap stories and perform many of their timeless hit songs. They’ll be sharing the stage, presenting an acoustic concert not to be missed. Three stars for one great ticket price! Click here to get your tickets now! Comedian Bill Engvall told Randall Mielke of the Chicago Sun Times that “When I perform, I liken my act to a bunch of friends just getting together to have a good time. I’m like the guy next door,” Bill told the reporter. “I view my show like we’re all just sitting around like neighbors and I happen to be the funny one.” Engvall finds humor in everyday situations – “People identify with what I have to say.” Come identify! Get your tickets now!